PLANTING: Best way is to buy organically grown and maintained container plants from organic nurseries. Rosemary can also be grown from stem cuttings but is difficult to grow from seeds. BLOOM/FRUIT: Blue or white flowers bloom intermittently throughout the year. Sometimes the plants are very showy. PROBLEMS: Freeze damage, spider mites, wet feet. Good drainage is a must. Many people think that the upright form is more cold hardy than the spreading but experience shows that the spreading form is just as tough. Rosemary has many tiny, hairlike roots. Intolerant of being permitted to wilt because of lack of water. Water lightly, but often and mulch heavily. Rainy seasons cause adventitious roots to form along the stem of the plant. Applying cornmeal to the soil can save plants that are being brought down by root diseases. CULINARY USES: Indispensble in cooking beef, wild game and meats of all kinds. Delicious in breads, vinegar and butters. Delicious in teas. 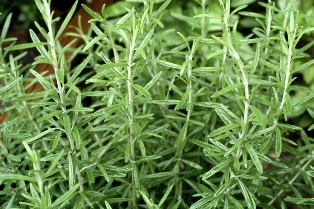 MEDICINAL USES: Rosemary is used as an antiseptic, a memory stimulator, a digestive, and is a longevity herb. It is a bath herb and improves hair condition. Compresses are used to relieve headaches. LANDSCAPE USES: Good for groundcover planting, potted plants, and hanging baskets. OTHER USES: Rub on dog fur after baths to help repel fleas. Rosemary flowers attract birds and bees and other beneficial insects. Burning rosemary in sick chambers together with juniper berries to deoderize and kill bacteria is a historical use. Rosemary tea has a red color and can be used to spray or splash on the skin of dogs to repel insects. Some people use the tea to rinse dark hair. Tie together a small bundle of the branches and use as a brush for the barbecue. INSIGHT: ‘Arp’ has a freeze tolerant reputation but it seems to be somewhat overblown.